Rev. Dr. Sarah Sarchet Butter is Sr. Pastor of The Village Church, UCC, in Wellesley, MA. 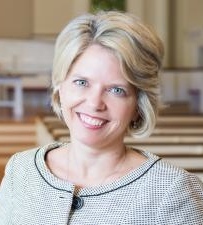 Her PTS MDiv (1992) is complemented by an MBA from Northwestern University's Kellogg School of Management ('98) and a DMin from Garrett-Evangelical Theological Seminary ('16). Sarah loves God's way of making more of us together than any of us could be a part, and she is committed to creating beloved community that reflects the light of Christ into the world. Her expertise includes developing new stewardship paradigms and organizational resource and talent development. Prior churches served include PCUSA congregations in Cincinnati, Chicago, and Wilmette. She cherishes her husband Dr. John Butter, and teen daughters Elizabeth and Caroline. Her motto: "God is great, and we have great work to do together!"